Well hi there! The new catalog has been live for almost a week now and it has been a big hit! 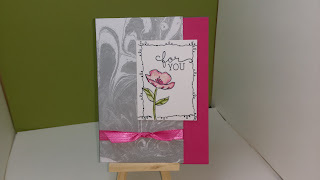 I have another sample for you, using some new stamps from the Occasions catalog and the Sale-a-bration catty too! I love how the Mellon Mambo and Smoky Slate come together to make this card. The Designer Series paper comes from the Sale-a-bration catalog while the stamped flower and sentiment comes from the stamp set Blooming Birthday found in the new Occasions Catalog. The stamped border is from the Tin of Cards stamp set found in the Annual Catalog. For the layout, I found a sketch on Pinterest and followed that and there you have it, a bright and cheery card. In honor of the new mini catalog, I am going to have an On-line party and I would like you to come. I invite you to place a minimum order of $30 before shipping and tax, using the hostess code: AZHFKHGX and you will be placed in to a drawing for the hostess rewards. Just go to my online store and place your order. I will close the party out on January 30th and will notify you by email that day to pick out your hostess reward items; so be sure to not check "No Contact" when placing your order, otherwise, Stampin' Up will hide your contact information from me and I will not be able to contact you. Now, if you place a $50 order, before shipping and tax, you will also be able to pick out a FREE item from the Sale-a-bration catalog as well! Now,if your order totals $150, DO NOT USE the hostess code! You will automatically qualify for hostess rewards!! And for every order placed, I will send you the complete supply list and instructions for this card as an extra little bonus from me. If you need a catalog, please feel free to contact me and I will get one out to you right away. I hope you are all having a great start to your weekend! Be sure to enjoy and get some stamping in and I will see you all here again on Tuesday!